We've all been there. The "I'm only going out for one drink but it turns into six and I'm pouring myself into bed at 3am" nights. The "Just one more chapter, except then just one more after that, and one more after that" evenings. Whatever your excuse may be, it's pretty much guaranteed you've woken up with dark circles under your eyes at least once. And let's face it -- who likes to look like they've got two black eyes? 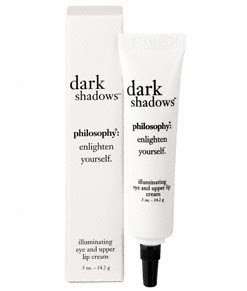 Luckily, Philosophy's Dark Shadows: Illuminating Eye and Upper Lip Cream is here to save the day. This beauty chick has been known to have circles so dark and so deep they literally look carved into her face. But with this miracle product, they immediately lighten and almost disappear! Say goodbye to the old spoon in the freezer trick, because this silicone-based product seriously works! In just two uses, my skin already looks brighter, my eyes look whiter, and my whole face looks more awake. At $33 on Philosophy's website, that might seem a bit steep. But would you rather walk around looking like you've been on a bender for five nights straight, or appear youthful, refreshed and happy? I thought so.